This cake is a lesson in learning to roll with things, quite literally, and the importance of powdered sugar. I don’t make banana bread often, in fact, it had been years since I’d made a loaf until the idea struck to make this banana bread roll cake. 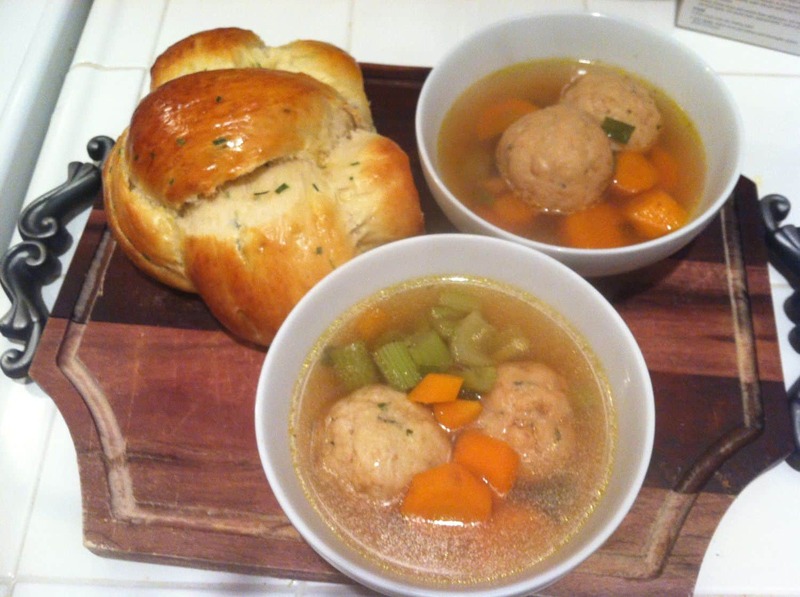 You see, we’ve been watching the Great British Baking Show on Netflix. 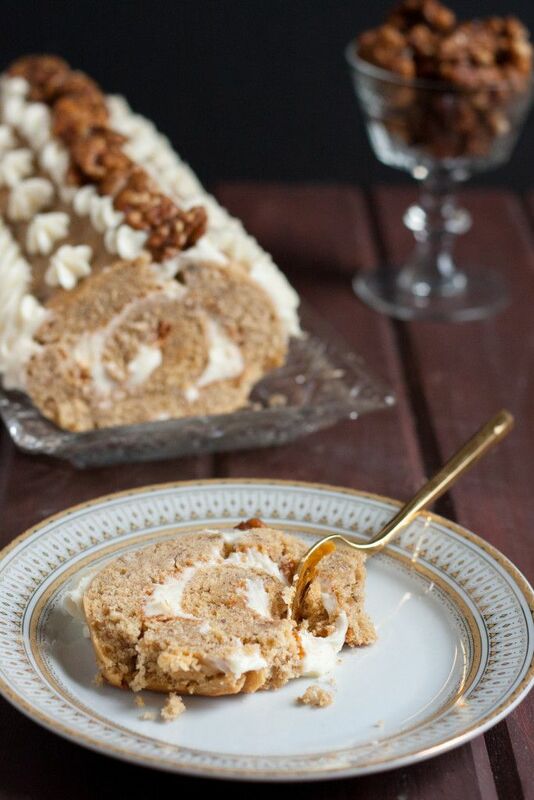 In the very first episode of Season 1, the contestants had to make a roll cake, and the Godfather had to listen to me go on for the next 48 hours week about how I was going to turn everything into a roll cake. Everything. Surprisingly enough, I don’t do very much baking around the holidays. I enter each holiday season with the best intentions, and usually bake quite a bit Thanksgiving weekend (one year we had 3 pies for the two of us), but then it fizzles and I’ll make a little here and there until inspiration returns in January. Does this happen to anyone else? 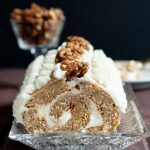 Anyway, we watched that episode of the show shortly before Christmas, and when a bag of walnuts caught my eye in our pantry, my mind immediately went to bananas and I wanted to make a banana bread roll cake with cream cheese filling and candied walnuts. But timing between banana readiness and holiday “life things” didn’t give me time to make this cake until Christmas morning. That kind of worked out because we were heading to my aunt’s house for a bit to visit with her and her family that afternoon, so I had a place to share this cake. BUT, I wasn’t being as detail oriented as I usually am, and I most definitely under-powdered the tea towel I used to wrap the cake. So while it rolled beautifully, it stuck as it unrolled and broke in two spots. Thankfully, I was planning on decorating the cake roll, so I adapted the design and I think I hid it rather well. Next time, I just need to remember to use at least a moderate dusting of sugar on the towel. Preheat the oven to 350 F (180 C, gas mark 4) and line a jelly roll pan with parchment paper or a silicone liner. If using parchment paper, leave a little extra on each long side, leaving only the short sides of the pan exposed directly to the cake. Grease the sides of the pan. Set aside. Cream together the butter and sugar, then stir in the eggs, one at a time. Stir in the mashed banana and lemon mixture, and the vanilla. In a separate bowl, sift together the cinnamon, flour, baking soda and baking powder. Add half the dry ingredients to the bowl of wet ingredients. Scrape the sides of the bowl. Stir in all the sour cream. Add the rest of the dry ingredients and stir until just combined. Pour the mixture into your prepared jelly roll pan and bake 16-20 minutes until a tester inserted into the center of the cake comes out clean or with just one or two moist crumbs. Watch it carefully as it's important not to over bake! Run a butter knife along the un-lined edges of the cake pan to prevent sticking. Liberally dust a clean lint-free dish towel with powdered sugar and carefully invert over the still-warm cake. Place a cooling rack or other flat surface against the top of the cake on the other side of the dish towel, then invert the baking sheet, dish towel, and jelly roll pan so the jelly roll pan is now on top. 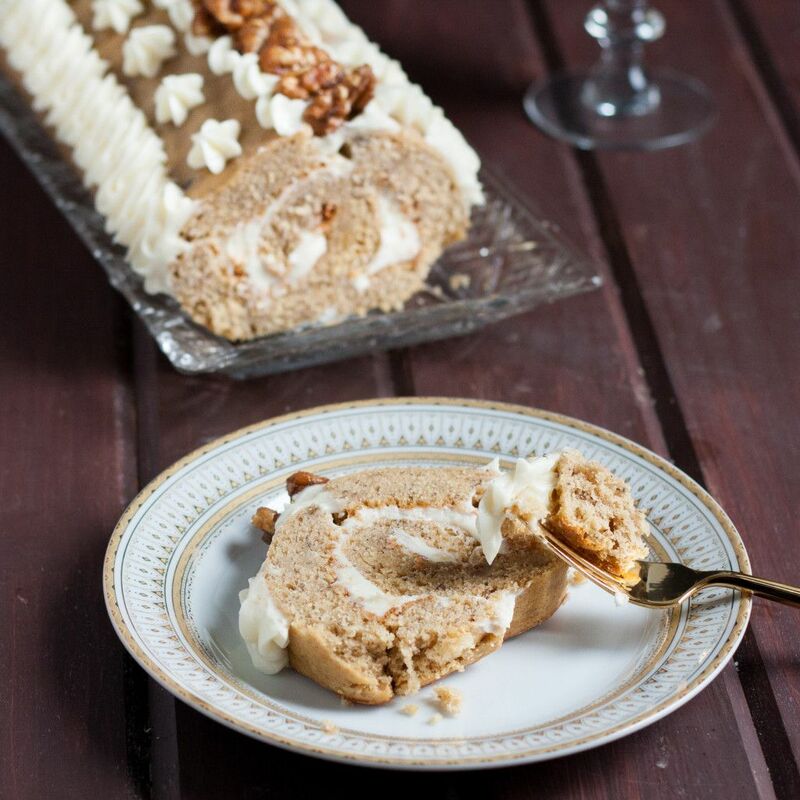 Carefully remove the jelly roll pan and starting at the short side closest to you, roll the cake, towel, carefully peeling away the parchment as you go. Place the rolled cake wrapped in the towel on a cooling rack, seam side down, to cool completely (this takes at least 2 hours). Lower the oven heat to 325. Line a baking sheet with parchment paper or a silicone liner. In a small saucepan, combine the vinegar and sugar, and cook over medium low heat, until the sugar has completely dissolved and the mixture begins to thicken. Stir in the walnuts, then pour the nuts and syrup onto your prepared baking sheet and arrange as best you can in a single layer. Bake 12 minutes, stirring at the 6 minute mark. Remove from the oven and allow the nuts to cool on the sheet. They will become crunchy as they cool. Cream together the softened butter and cream cheese. Add the powdered sugar 1 cup at a time, incorporating completely after each addition. Gently unroll your completely cooled cake and remove from the towel. Fill with the frosting mixture, leaving about a 1" margin on the outside short edge, and about a 1/2" margin along the long edges. Re-roll the cake. Wrap in plastic wrap and allow to chill in the refrigerator at least 30 minutes. 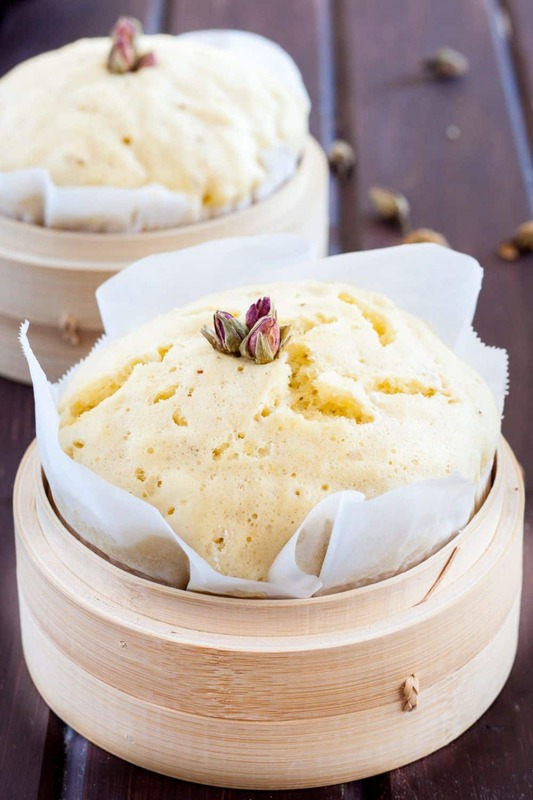 You may also double-wrap the cake here and freeze for up to 1 month. 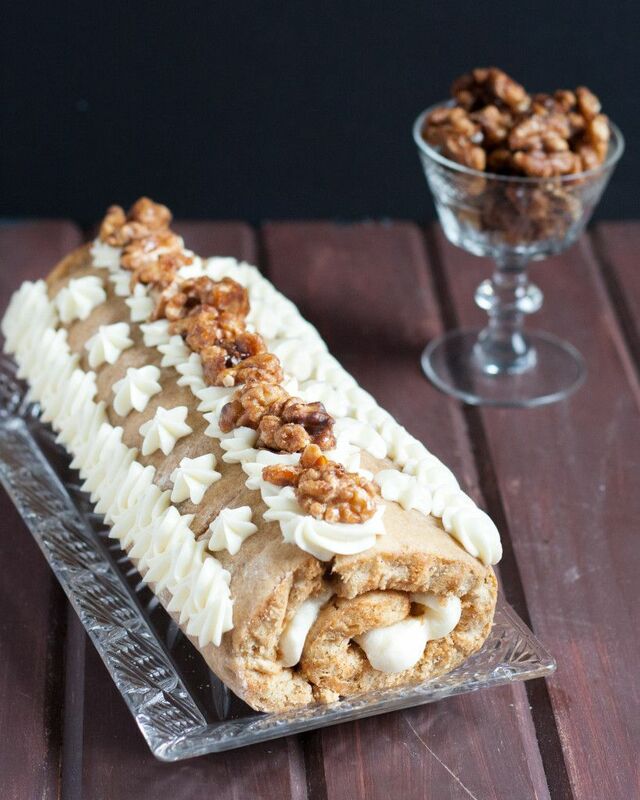 After chilling, place the cake on a serving plate, decorate as desired, and top with the candied walnuts. You may choose to make the walnuts up to two days in advance and store in an airtight container at room temperature. The extra walnuts make a delicious salad topping too! 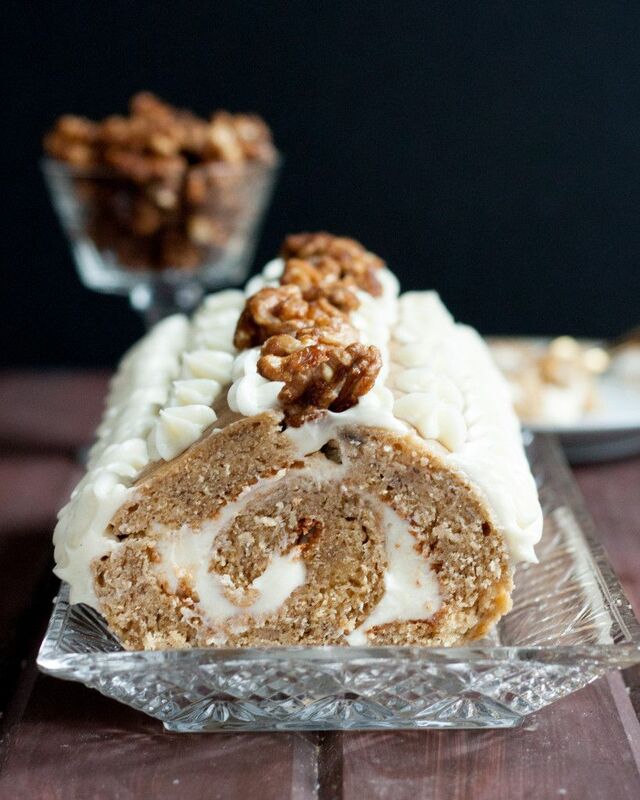 This looks so moist and delicious 🙂 I binge watched the Great British Baking Show a few months ago and had dream of cake rolls for awhile after that as well!! Right? I basically wanted to make something after every episode. I love that you use the banana roll even though it stuck and broke. It looks great! Personally I learn more from the things that don’t work out perfectly. I teach cake decorating classes and I frequently tell my students “icing makes great glue” whenever their cakes crumble. Thanks for sharing a great post.